The Aquasol solar heating system is a High Quality Polypropylene panel system that's available in 4'x8', 4'x10', or 4'x12' size panels. The standard system comes with 2" headers making them perfect for any installation including replacement of Fafco solar panels etc. Piping is purchased locally. Just determine the surface area of your pool and purchase 50-60 % of the pool surface area in collector area. Example: A 400 sq. ft. surface area pool would use 6 - 4' x 10' solar collectors for a total panel area of 240 sq. ft.
2 Connection Hose 33/4" 2 System Connector Hose 7" 2 Connection Hose 33/4"
The Aquasol solar heating system is a High Quality Polypropylene panel system that's available in 4'x8', 4'x10', or 4'x12' size panels. The standard system comes with 2" headers making them perfect for any installation including replacement of Fafco solar panels etc. Piping is purchased locally. Just determine the surface area of your pool and purchase 50-60 % of the pool surface area in collector area. Example: A 400 sq. ft. surface area pool would use 6 - 4' x 10' solar collectors for a total panel area of 240 sq. ft.
Any size system can be shipped economically. Just pick the panel size that best fits your needs and a System Kit (1 required with each system). Add-A-Row Kits are available if the panels can't be laid out in a continuous row. For the utmost in convenience and maximum heating we offer the Pentair & Goldline Automatic Controllers as an upgrade to your system. Note: If you're not going to use one of our Automatic Control Systems you will need to purchase a Manual Control Valve to operate your solar panels. Our Aquasol system comes with a 10 Year Limited Warranty so you can buy with confidence. Aquasol panels are IAPMO and NSF50 listed for all areas for both residential and commercial installations. Premium grade 4 foot width panels, not the lesser quality harder to install 1 foot and 2 foot width panels sold by many companies. Have questions concerning solar heating your pool? Click Here For Aquasol Parts & Accessories. 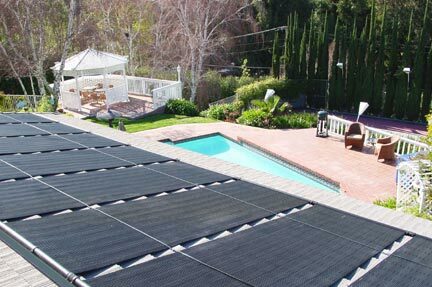 Click Here For Help Selecting The Right Pool Solar Heating System. Click Here For The Aquasol 10 yr Warranty.